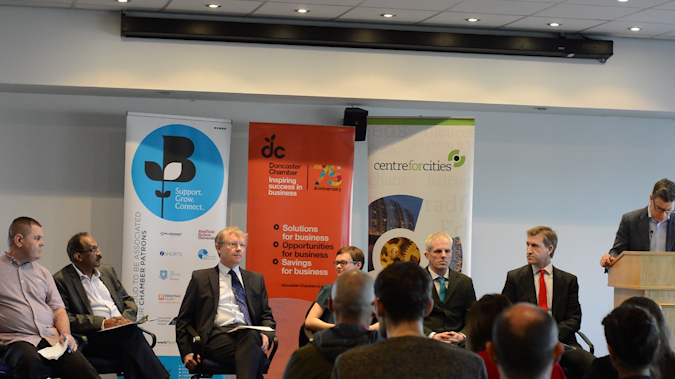 Last week Centre for Cities and local Chambers of Commerce held the first hustings for the Sheffield City Region mayoral election with all the leading candidates, focusing in particular on their plans for the local economy (Dave Allen of the English Democrats could not attend). The big attendance at Meadowhall showed the considerable appetite from business leaders and the wider community to hear about the plans of the prospective mayors, in what has been a low-key campaign so far. First, half of the candidates present – Dan Jarvis (Labour), Mick Bower (Yorkshire), Rob Murphy (Green) – are running for a position they would seek to abolish as soon as possible, in favour of a whole Yorkshire devolution deal (with or without a mayor). Second, disagreements between members of the combined authority (made up of Barnsley, Doncaster, Rotherham and Sheffield) – and with the Government – mean that the public consultation needed to unlock the powers and resources on offer as part of the city region’s devolution deal has not yet taken place. The upshot is that whoever is elected on 3 May will have next-to-no powers and funding until they bring together combined authority colleagues to overcome the procedural hurdles needed to rubber-stamp the devolution deal. Only then will they gain the full powers and funding on the table: £900 million investment over 30 years, a significant share of the £1.7 billion ‘Transforming Cities Fund’, and considerable powers over skills, transport and housing. It was not surprising then that the first question asked at the event (from a representative of the Chamber) was how would the candidates help the combined authority to work together, and how could businesses help? Hannah Kitching (Liberal Democrats) called for independent external mediation to overcome longstanding internal disputes and promised to be an honest broker on the combined authority. She also said that she would make the argument that ‘you don’t have to dim anyone else’s lights to make yours shine brighter’ – referencing concerns that Sheffield has been prioritised in the combined authority, particularly over the move of the local HS2 station from Meadowhall to Sheffield city centre. The Conservatives’ Ian Walker would seek to get business voices involved in a revived South Yorkshire Forum. He would not rule out a Yorkshire-wide deal but would make the case for getting the money on offer now flowing. Rob Murphy of the Greens argued that the closed nature of the combined authority allowed leaders to behave badly, and that opening up the whole system to greater public scrutiny would shame leaders into a greater collaboration. Mick Bower of the Yorkshire party would join those calling for a Yorkshire-wide deal on the combined authority, and use the mayor’s mandate to pressure the government to agree to this objective. A number of candidates questioned whether Dan Jarvis, as a Labour candidate and an MP in the area, would be able to mediate effectively between Labour-controlled councils. His response was that for those very reasons, he is best-placed to work with the councils and that what was lacking was leadership, not mediation. Jarvis argued that his clout and credibility with local leaders and Sajid Javid (Housing, Communities and Local Government secretary) would get the process moving forward within the week. Naveen Judah, candidate for South Yorkshire Save Our NHS, promised to bring no bias or dogma, and offer impartial and transparent leadership to build the trust needed to bring the combined authority together and unlock new powers. Buses were the focus of questions on transport, due to declining numbers on local services and the high number of people in the city region using private vehicles. The new mayor will have considerable powers to act on this issue alone thanks to the Bus Services Act. Ian Walker wants fully integrated ticketing and more dedicated bus lanes to improve services and speeds. Mick Bower would push for better coordination of routes, promising to rationalise services in well-covered areas to provide services elsewhere. Hannah Kitching vowed to address the difficulty of travelling between local authorities via bus, describing it as ‘nigh on impossible’ in places. Dan Jarvis would use regulatory powers to improve services, before eventually moving to franchising and offering special concessionary fares and integrated ticketing. Finally, Rob Murphy reiterated his long-standing support for bus franchising and promised to bring it in as soon as possible, to enable greater cross-subsidy between profitable and less profitable but socially valuable routes. One of the key roles of the new mayor will be to raise the profile of the city region on the national and international stage and to attract more investment. Rob Murphy argued that electing a Green Party candidate would help to attract low carbon investment and show that the city-region has changed course. For Dan Jarvis, the key is to bolster the city region’s bid to be the new home of Channel 4 and to promote local cultural assets. He would work with ‘Welcome to Yorkshire’ and try to showcase the area’s quality as a place to live and raise a family to attract investors. Hannah Kitching argued that the city region must overcome what she described as a reputation for being inward-looking. She would place greater focus on supporting small and new firms to expand through introducing a growth hub. Ian Walker vowed to lead trade missions as mayor and highlighted the need to improve connectivity, skills and training – as well as creating more business parks and infrastructure as the key to attracting investment. Mick Bower argued that Yorkshire was the brand with the profile to get behind, and promised to show the city region’s outward-looking face by funding a new museum on the site where Sheffield FC (the oldest football club in the world) play. Naveed Judah argued for a visionary and forward-looking plan to attract global investors to work on artificial intelligence, robotics and environmental challenges. For Ian Walker, the key is tackling cultural barriers to women applying to study different subjects. Mick Bower would use procurement to favour local, smaller firms that invest in training, and use these rules to ensure these firms eliminate the gender pay gap. Citing local skills gap in engineering, one audience member asked how candidates would ensure vocational options are viewed with the same esteem as academic. All candidates agreed on the need to align employer demand with skills provision, and the value of bringing employers into the system to demonstrate available opportunities and the routes to achieve them. Hannah Kitching, Dan Jarvis and Mick Bower each called for more powers to intervene earlier and fund primary and secondary education rather than try to fix issues at 18. The answers given by the candidates show that they are thinking carefully about the challenges and issues the Sheffield City Region faces, even those who would prefer a Yorkshire-wide devolution deal. To tackle these issues, and to deliver for people across the city region, whoever takes office on 4th May will first need to bring together local leaders and overcome the disagreements which have delayed this election. Click here to watch the full hustings event. Want to receive updates on our research and analysis? Keen to be the first to hear about our upcoming events? Sign-up for our fortnightly newsletter here.